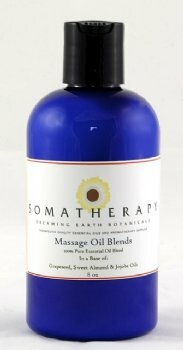 Essential Oils of Lavender, Petitgrain and Frankincense essential oils in our Massage Base Oil (Almond, Grapeseed and Jojoba). Use straight from the bottle for a soothing massage, after bathing to moisturize your skin, or add a cap full to a warm bath to relax before bedtime. Lovely, calming aroma.